While it seems a bit late to be posting about this, the peppery and juicy nasturtium leaves and basil gone to flower in my garden say otherwise. 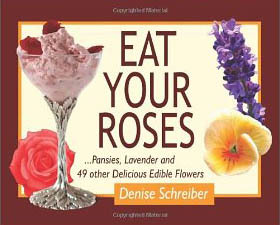 A while back I got a review copy of a cute little book called Eat Your Roses: ...Pansies, Lavender, and 49 Other Delicious Edible Flowers, by Denise Schreiber, published by St. Lynn's Press. From it, I learned that there are many more edible flowers out there, from calendula to pansies, and I wish I had planted more varieties this year. I keep on meaning to try some of the recipes in the book, particularly one of the liqueur recipes, or the rose petal jam, but haven't gotten around to it. Hopefully in the Spring I'll remember to stock up on edible flowers like anise hyssop, chamomile, and borage. Always nice to know that a garden can be pretty and edible, too.